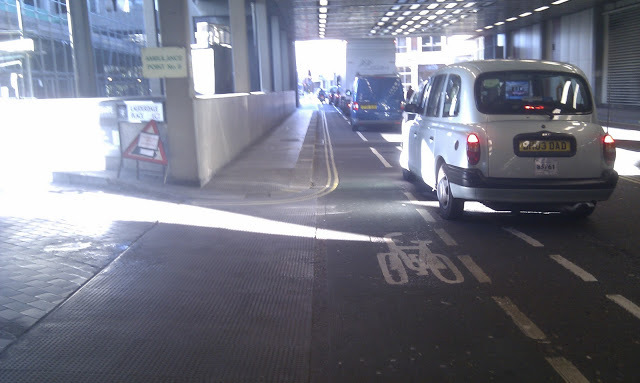 Cyclists in the City: It is not acceptable to willingly make a key cycle link between two Cycle Super Highways and the heart of the City of London more dangerous and more intimidating to travel along by bike. It is not acceptable to willingly make a key cycle link between two Cycle Super Highways and the heart of the City of London more dangerous and more intimidating to travel along by bike. At some point today, the City of London Planning Committee will meet to approve a strategy to improve the streets around Fenchurch Street. Much of that plan is good news: it seeks to make the area much better for walking. And, in theory, for cycling. But there's a rub. And the rub is Fenchurch Street. Fenchurch Street links Bank junction, in the middle of the Square mile with two Cycle Super Highways that come into the Square Mile from east London. It's a fairly uneventful street but it is easy, direct and works two-ways for people on bikes from end-to-end via Lombard Street, but only one-way for motor vehicles. It's a wide road with a bus route along it. And endless delivery vans and lorries. The City of London is quite right that parts of this street could be made better for walking and it is proposing to spend between £3-5million alone on improving this street (bear in mind the total budget from the Mayor for cycling in outer London this year is a pathetic £2 million). I profiled the scheme last year when the City of London ran a public consultation about its plans. My concern at the time is that this scheme (and others elsewhere that will be approved over coming months) all involve significant narrowing of the carriageway. In the case of Fenchurch Street, the City has plans to narrow the road to between 6.5 - 7 metres wide. To put that in context, a typical Volvo tipper truck (of which there are hundreds crossing the Square Mile daily) has a 2.5m wide driver's cab. Add in wing mirrors and it's 3.0 metres wide. Put simply, a truck and a bike can't get past each other on a 6.5m wide carriageway. As most people are all too aware, tipper trucks do not mix well with people on bikes and account for a disproportionate number of road deaths in London. The City has now published the responses to its consultation for the Fenchurch Street plan. Unsurprisingly, the City admits "There was significant comment received regarding the need to improve cycle safety throughout the Strategy area, including a desire for the provision of cycle lanes, particularly in busy locations such as Fenchurch Street and the adjacent junctions. Many comments were received about restricting traffic in the Strategy area to improve cycle safety and movement. Some responses commented that the draft Strategy did not account adequately for cycling needs and increased footway widths would impact on cycle safety." Even the Department for Transport's neolithic Cycle Infrastructure Design guide LTN 2/08 notes that if you want to mix buses, lorries and bikes, you need a nine metre wide carriageway. The Department notes: "Research from the Netherlands (CROW, 2003) shows that motorists driving at 20 mph will often pass cyclists leaving a clearance of only 0.85 metres [and] 1.05 metres when passing at 30 mph. These clearances are not necessarily sufficient for comfort and have been increased to establish the minimum suggested passing distances in Table 2.2 (above)"
Kingsland High Street as it used to look. Cramped lanes, everyone fighting over the same space. 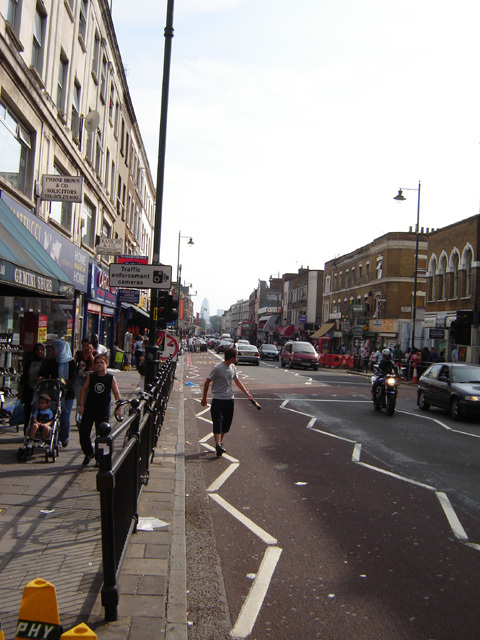 Nine metres is the width that Hackney council has adopted on a section of Kingsland High Street, for example, which is a heavily-used bus and bike route. It's not 'Dutch' and it's not perfect. But it gives cyclists and buses and lorries at least enough space to travel in generally separate flows without knocking into each other. The City's plans for Fenchurch Street would do the exact opposite: they'd encourage dangerous overtakes by motor drivers when traffic is flowing and when it isn't, they'd force cyclists to sit stuck in belching traffic fumes unnecessarily. There's plenty of research to back this up. The Transport Research Laboratory (former government body that is currently testing new cycle infrastructure layouts for Transport for London) wrote a report on "The effect of road narrowings on cyclists" in 2004. The report is pretty damning about the impact road narrowings have on cycling: "road narrowings contribute to the sense that parts of the highway network are inimical to cyclists". Yet the City of London is proposing to narrow the roads to make the environment better for walking and cycling. Although the TRL report is focussed on traffic islands and pinch points rather than whole street narrowings, I think the conclusions are still representative in this case: The Transport Research Laboratory notes that women, in particular, are intimated by road narrowing - 85% of women felt the presence of medium or heavy goods vehicles at road narrowings was "intimidating". It also notes that only 35% of people feel confident enough to "take the lane" i.e. to always cycle in the middle of the lane in order to prevent dangerous overtakes by impatient drivers at road narrowings. If you take this evidence and apply it to the current plan for Fenchurt Street, it would not be wrong to suggest that the City is proposing to build a street that only 35% of people who cycle will always feel confident enough to use "properly", i.e. by placing themselves directly in front of an HGV. The result of this sort of road narrowing, says TRL, is that people either don't cycle or they cycle on the pavement where they feel safer. It's terribly odd that the City authorities don't understand this point. They understood it perfectly in the north of the City of London at Beech Street. This tunnel used to feature two motor vehicle lanes. It now features one lane for motor vehicles and one for bikes. Perfect. Everyone here now has their own stream of traffic. And the City of London admits this has been a huge success. The TRL report is just as clear as the Department for Transport that narrowing carriageways in the way that the City of London has proposed at Fenchurch Street is bad news for cycling: "Where narrowing features are provided in order to calm traffic, it is recommended that they should not be installed where they lead to running widths of less than 4m", i.e. not 3.25-3.5 metres as proposed here. I think that very slowly, the message is getting through to the City of London authorities that narrowing roads is bad news for safe and easy cycling unless you leave sufficient space for people on bikes and people in trucks to flow around and past each other safely. What gives me some hope is that the minutes of the Fenchurch Street report, presented to the City's Planning Committee says this: "Whilst the Fenchurch Street proposals received significant support, there was also concern raised that a reduction in carriageway width would result in a less safe road environment, particularly for cyclists. The Strategy document has been revised to highlight that whilst there is clear evidence that the pedestrian environment needs improving and increased capacity, this will not be undertaken at the sake of cyclists". If the City goes ahead with its original plans to narrow Fenchurch Street to 6.5 metres, it would be the height of irresponsibility and send the Square Mile in exactly the opposite direction of all prevailing guidance and of what is being practised up the road elsewhere in London. Let's hope that today's committee meeting agrees with the report that although the pedestrian environment needs improving, it is not acceptable to willingly make a key cycle link between two Cycle Super Highways and the heart of the City of London more dangerous and more intimidating to travel along by bike. I know of four major construction projects planned in the City that will use Fenchurch Street as a lorry route, and there are probably more I don't know of. Not really compatible with a cycle route on narrow lanes. On streets where the carriageways have been narrowed, like Oxford Street, I can't see how it is safe for a bus to pass me especially when the pavements are full of pedestrians who are apt to step into the carriageway without looking. Cycling in the middle of the carriageway doesn't make me especially popular and it's a bit embarrassing actually, but I can't think of another way except dismounting. Very poor design. If the issue is the "look" of the street, could they not take the carriageway down to the 6.5m and then have protected cycle tracks in a material to compliment (but not necessarily match) the footways? It would then be possible to have the street "clutter" between the cycle track and the footway so it gives a bit of a buffer to reduce the risk of pedestrians stepping into the track. They would achieve the look that they no doubt want, but protect cycle users - looks like tons of room to me. I've been doing a fair bit of walking through the city recently. It is awful. The pavements are so crowded I usually find myself walking in the road. A bit like cycling in the road I sometimes get beeped at but I'm pretty numb to that by now. The only thing that seems worse than walking in those conditions is cycling. I watch the cyclists wide-eyed with disbelief, expecting a collision for every overtake I see. It just makes me think...there's not enough room for cars on some of these roads. Once you've provided enough space for a pleasant walking experience, you have enough space for a decent size cycle lane and that's it. Beyond that, you have to admit that the city of London's streets are too narrow to have cars as well. Fenchurch st looks like a good candidate to trial an outright traffic-removal programme to create a traffic-free network of streets within the city. p.s. that awfully narrow cycle lane at Beech st is getting a wee bit too much praise! If they go ahead with the narrowing, can we not challenge the decision under Judicial Review?